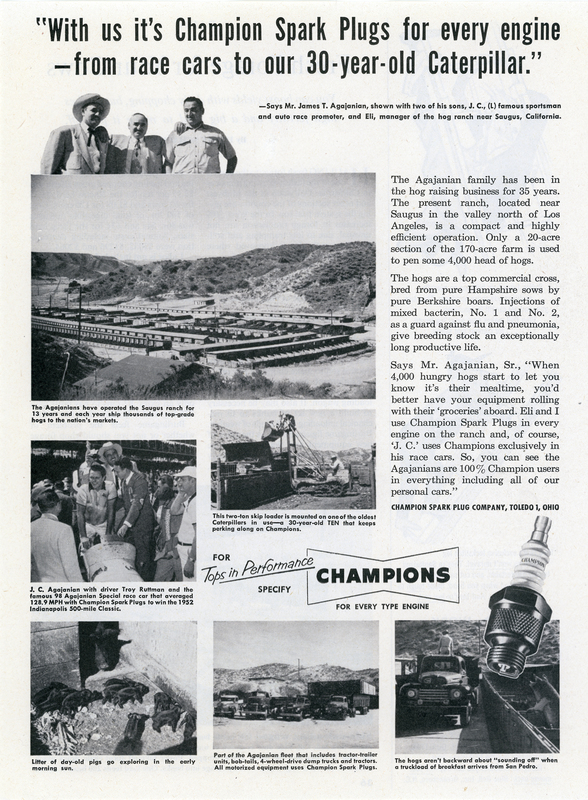 SCVHistory.com LW2866 | Haskell Canyon | Early Waste Disposal: Agajanian's Hog Farm, 1953. Agajanian's Saugus hog farm featured in a full-page (8x10.5-inch) Champion Spark Plug advertisement in an unidentified livestock magazine, 1953. Text of advertisement appears at bottom. The Plum and Haskell canyon area was dotted with hog farms in the 1930s-1950s. The Agajanian family's Saugus ranch was located in Haskell Canyon; their pig pens were located in and east of today's Haskell Canyon Wash, near the junction of Haskell Canyon Road and a new street that bears the family name (see map). Hog farms were the garbage dumps — or more correctly the waste recycling centers — of their day. Food waste was trucked from restaurants and homes to farms, allowed to ferment for a couple of years, and fed to the hogs. By the 1930s, hog feeding had become the nation's most common method of food waste disposal, and every city in Los Angeles County sent garbage to hog farms. Solid waste management isn't a new political football. Growing metropolitan centers have been dealing with "garbage crises" since the 1800s. After a hog cholera outbreak in 1911, Los Angeles County temporarily banned feeding garbage to swine in the interest of public health. Then in the 1930s, studies started to link trichinosis outbreaks in humans with garbage-fed hogs. Municipalities cracked down. The city of Los Angeles declared people's trash to be city property and outlawed the transport of waste on city streets without a permit. Small, independent operators who collected and sold garbage to hog farms were pushed out of business. It was the city's garbage now, and the city sent it to a giant hog farm in Fontana, San Bernardino County. Trash hauling was on the road to becoming a municipal service. So a lot of the independents moved to the unincorporated boonies, i.e., Saugus. Most were Armenian immigrants and their descendants — Agajanian, Arkalian (Anglicized to Arklin), Kazarian, Assadourian and more. James T. Agajanian had been raising hogs for more than two decades before he moved his operation to Saugus in 1940. One of his sons, Elisha, managed the 170-acre farm and the 4,000 head of hogs that chowed down on a 20-acre section of it. Many local hog farmers became civic leaders and parlayed their early ranching careers into local business empires, both inside and outside of the trash business. Elisha Agajanian, known as "Aggie," was no exception. In addition to Blue Barrel Disposal Co., which he founded to haul food waste to the family hog farm, Aggie founded Santa Clarita National Bank with Don Guglielmino (Newhall Hardware) in the 1960s. He served on the Hart High School Board and Castaic Lake Water Agency Board simultaneously in the 1960s and '70s, as well as the board that created Henry Mayo Newhall Memorial Hospital. In 1990 he received the Silver Spur award for community service from the College of the Canyons Foundation. Meanwhile, solid waste management concepts continued to evolve. L.A. City outlawed home incinerators in 1957, and "town dumps" morphed into "sanitary landfills." Feeding garbage to hogs is illegal today. Aggie Agajanian sold Blue Barrel in the 1960s. 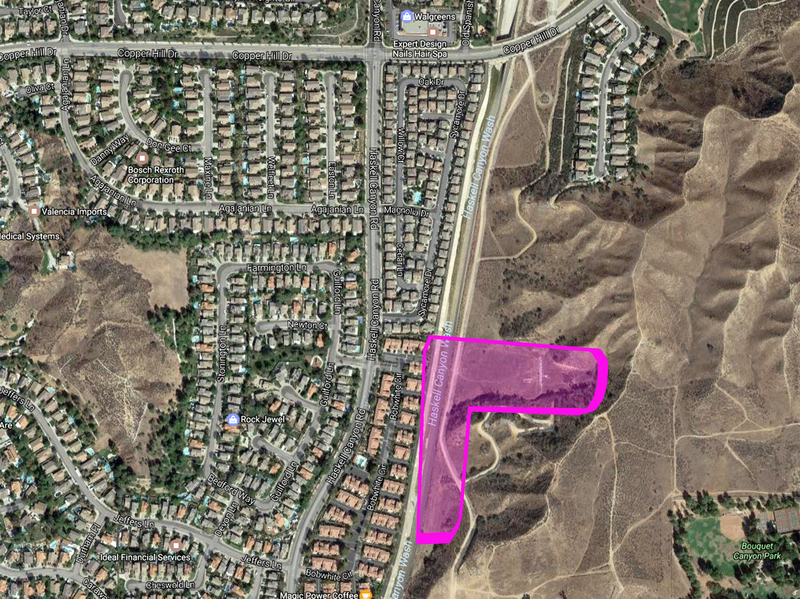 Its last "local" owners were Sam Assadourian and his nephew Nazareth Chobanian; the pair also owned the relatively small Chiquita Canyon Landfill in Val Verde. Just as hog farming regulations forced the "little guys" out of L.A. City in the 1930s, new and costly regulations pushed local families out of the trash business entirely in the 1990s. Assadourian and Chobanain sold Blue Barrel in 1991, when it was a $5.5 million annual business, to Western Waste Industries, and they sold their landfill to Laidlaw Waste Systems, which significantly expanded the landfill's footprint and tonnage capacity over the next 20 years. The 1990s also saw rival Santa Clarita Disposal Co., founded in 1977 by the Arklin family, who owned the Palmdale Landfill, go the corporate route. Today (2017), Blue Barrel, the former Santa Clarita Disposal and the Palmdale Landfill are all components of Waste Management. Chiquita is owned by Texas-based Waste Connections Inc.
1. HistoricAerials.com, as noted by Todd Spiegelberg. 2. Charles "Pete" Benz, personal communication circa 2012. 3. Rogers, Heather. "Gone Tomorrow: The Hidden Life of Garbage." New York: The New Press, 2005. 4. Lindner, Christoph, and Miriam Meissner, editors. "Global Garbage: Urban imaginaries of waste, excess, and abandonment." New York: Routledge, 2016. 6. Linder and Meissner, op. cit. 7. Nazareth Chobanian, personal communication 1-18-2017. 8. Champion Spark Plug advertisement, 1953. 11. Michael Trueblood, personal communication 1-18-2017. 12. Linder and Meissner, op. cit. 14. Los Angeles Times, 1-26-1991, citing Western Waste Industries as the information source. 15. Chobanian, op. cit. : New regulations required all landfills to have liners, which would have cost the Chiquita landfill owners $10 million, so they sold the business. Previously, Chobanian said, Chiquita had been deemed one of the cleanest landfills in the state, and its underlying hard clay prevented leaching. Location of the hog pens on the Agajanian family's ranch in Haskell Canyon. "With us it's Champion Spark Plugs for every engine — from race cars to our 30-year-old Caterpillar." — Says Mr. James T. Agajanian, shown with two of his sons, J.C., (L), famous sportsman and auto race promoter, and Eli, manager of the hog ranch near Saugus, California. The Agajanian family has been in the hog raising business for 35 years. The present ranch, located near Saugus in the valley north of Los Angeles, is a compact and highly efficient operation. Only a 20-acre section of the 170-acre farm is used to pen some 4,000 head of hogs. The hogs are a top commercial cross, bred from pure Hampshire sows by pure Berkshire boars. Injections of mixed bacterin, No. 1 and no. 2, as a guard against flu and pneumonia, give breeding stock an excepionally long, productive life. Says Mr. Agajanian Sr., "When 4,000 hungry hogs start to let you know it's their mealtime, you'd better have your equipment rolling with their 'groceries' aboard. Eli and I use Champion Spark Plugs in every engine on the ranch, and, of course, 'J.C.' uses Champions exclusively in his race cars. So, you can see the Agajanians are 100% Champion users in everything including all of our personal cars." Champion Spark Plug Company, Toledo 1, Ohio. LW2866: 9600 dpi jpeg from original advertisement purchased 2017 by Leon Worden.